Lantern-like seed capsules are blushed with pink. 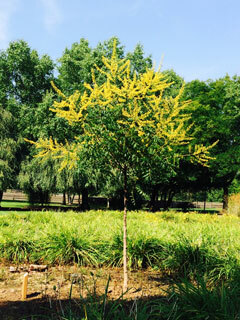 Unusual for its foliage that holds up nicely in summer heat, its leaves are darker green, smoother and more glossy that typical of the species. 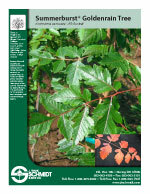 Discovered by Sunleaf Nursery, it is appreciated for its symmetry, heat resistance, and improved foliage quality.